Each package contains five cookies. The cookies will be shipped in a box of any four packages (20 cookies). The packages can be mixed and matched to your desire. A box of 20 all natural cookies (four packages) is $34.96; this price includes shipping and handling. You must choose 4 packages of any type of cookie. Orders received for cookies that are not in increments of 4 packages will be re-funded. 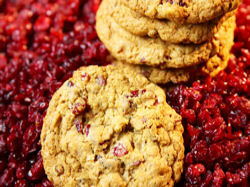 Cranberry Oatmeal - This is the same great cookie as our Oatmeal Raisin cookie, but plump fresh cranberries are used instead of raisins. 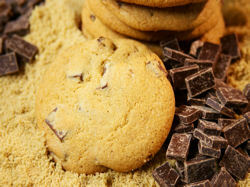 Please remember, you must order 4 packages of any kind of cookie to complete the order. 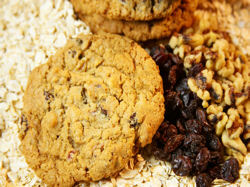 Oatmeal Raisin - These are our famous soft and chewy Oatmeal Raisin cookies. They contain fresh oats, raisins, and walnuts. These cookies are truly a delight. Chocolate Chip - These classic Chocolate Chip cookies are made with the finest bittersweet Chocolate chips which make them a traditional favorite. 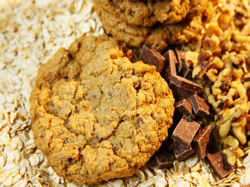 Chocolate Oatmeal - A combination of walnuts, oatmeal, and bittersweet chocolate chips also make these cookies a favorite. 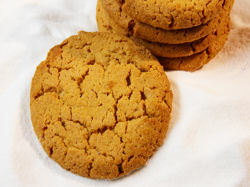 Peanut Butter - A strong tasting peanut butter cookie made with a fresh all natural peanut butter from North Carolina. 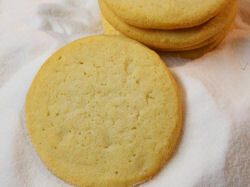 Sugar - A sweet, chewy and delicious tasting classic cookie.